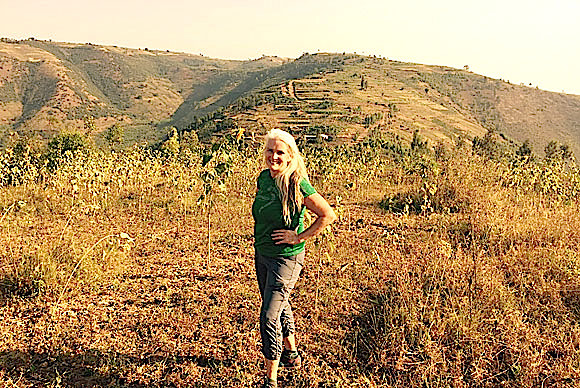 Marie Fitzsimmons says she is "always hiking in the mountains" of Rwanda. 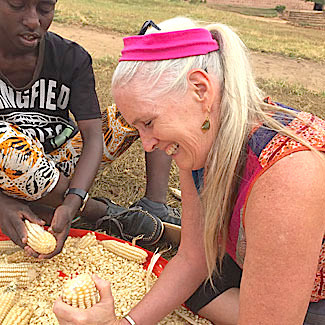 Watkins Glen High School teacher Marie Fitzsimmons and her husband, Kirk Peters, have been working in Rwanda, on the continent of Africa, as part of the Peace Corps. They both served as Peace Corps volunteers when they were young adults, and again in 2014-15 in China and Namibia. Marie's latest report since they departed the United States in May follows. It is three months since Kirk and I left our hometown for Peace Corps Rwanda and it is only now that I can begin to tell the story of our lives here. This is so on an emotional level and also on a technological level. It is the first time to have the 3G necessary to use my computer ... And really, my first time to think that just maybe I can begin to tell you of the land of one thousand hills. Just maybe. For I am still learning. Kirk and I began our marriage as Peace Corps Volunteers in Lesotho in 1981 and fell deeply and permanently in love with Africa and the vision that President Kennedy laid out for Americans in 1961. Our early Peace Corps experience of two years in the mountains of Lesotho shaped our lives and became the cornerstone of our global understanding and our personal commitment to doing good in the world. Rwanda is a small country in central east Africa and is just the size of Vermont. She is a mountainous land with lush vegetation and breathtaking beauty. And she has suffered so. In my ACE Modern Africa class and 10th grade Global History at WGHS, we studied the history of Africa. We marveled at the Great Rift Valley and the discoveries of early human life. We wondered at the 4,000-mile stretch of lakes and river valleys that is home to an ancient history that enthralled us. We felt sorrow and anger while studying the European scramble for Africa and the subsequent devastation of communities. Students were astonished to study the role that Africa played in both world wars and mourned the death of so many soldiers who fought under flags in far away lands. We studied Independence movements and cheered great leaders whose devotion to their people and culture cultivated hope. And we agonized over those whose self-interest continued to marginalize the very people that they sought to liberate. The story of Rwanda is still raw and difficult and it is with careful discipline that I pen her recent history. I am far too in love with the people and the land to do so without agony. In 1884, the Berlin Conference certified the colonization of Africa by awarding her land to Great Britain, France, Germany, and such.The people of Africa were taken over by the European powers and Africa was carved into a bizarre patchwork of landholding that was devoid of respect for land, people, culture, or language. Rwanda was awarded to Germany but after WWI, Germany lost her holdings in Africa and Belgium received control until the time of Rwanda's independence. The effects of European control were devastating and laid the groundwork for the atrocities that followed. In Rwanda, it is no longer permitted to differentiate between supposed ethnic groups and I hesitate to do so here. Let me briefly and tearfully write that ethnic conflict ensued and that in 1994, genocide occurred. From April to July, approximately one million people were murdered. There are no words to write of such sorrow. It is 23 years since the unspeakable occurred. It means that there is no one in the country whose life has not been impacted by the terror of that time. The sons and daughters of survivors are not immune to the history of their parents and while hope and peace fill the land, trauma can take generations to heal. So it is that I hold the hand that only exists in memory. The ravages of machetes are not uncommon but they sear the soul as though the violence occurred in this very moment. So it is that the elders hold such grief and loss in their souls. So it is that Rwanda is now so grateful to be at peace. Peace Corps has served in Rwanda since 1975. Volunteers were evacuated during the genocide and Peace Corps was asked to renew its presence in 2009. 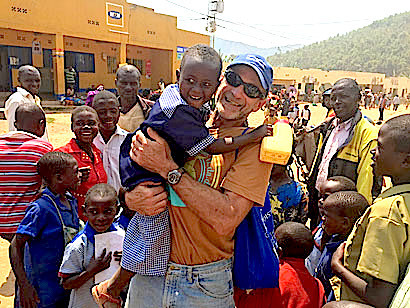 There are over 160 volunteers in Rwanda and the work we do ranges from education to agricultural, business and health, and Kirk and I are answering the request of the government to aid in oral language development. Most volunteers serve for two years after a 10-week training, but Kirk and I are part of what is known as Peace Corps Response. Response Volunteers are usually former volunteers who have long-term professional expertise; however, there are also Response Volunteers serving with Peace Corps for the first time. Their skills and experiences are needed to jump-start programs and develop the framework for working relationships. Just today, we met four new Response volunteers who bring a wealth of expertise along with their beautiful hearts. Kirk and I live at a vocational high school where students come from all over the country to study in one of our three programs: veterinary technician, food processing, or agriculture. The school is a working farm with goats, sheep, cows, donkeys, chickens, pigs and goats. We grow bananas, papayas, beans, cabbages and potatoes, and our students become adept in farm practices and food processing. We make pineapple and banana wine, jams, breads, sausages, and such. Almost everything we use is produced by our school, and it is an impressive model of technical education. Our students are in the classroom half the day and then out in the fields, in the barns or in the cooking workshop. 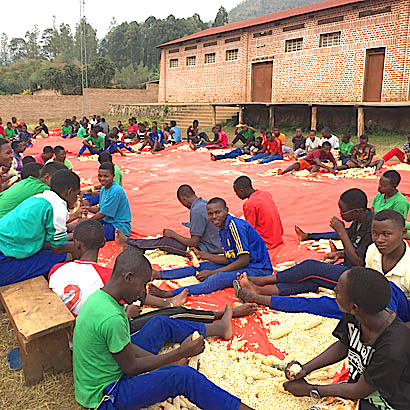 We have 350 students ranging from 15 to 21 years of age and it is hoped that their training will contribute to the development of Rwanda and reduce the raging unemployment. The students attend the program for three years and then must pass their national exams to receive their upper secondary degrees. Right now, our seniors are away at their internships all over the country and we have been receiving excited messages of their experiences. They return to campus in two weeks and will be filled with stories of what they have learned. Of course our school is a perfect match for Kirk with our many animals and one educational focus on veterinary medicine. It's true that we don't have the tools or medicines of a modern veterinary practice, but our curriculum is detailed and our students are afforded hands-on experience. They vaccinate the chickens, observe surgeries, and aid in meat inspections. Kirk's knowledge and lifetime experience meshes with his patient teaching, and the vet students are always gathering around him for further understanding. The veterinary work is devoted to the health and safety of food production as pets are virtually unheard of. Our American devotion to cats and dogs is beyond puzzling. Our school is also a perfect match for me. The Rwandan government is working to make English the language of the country and efforts have been in full swing for about 10 years. 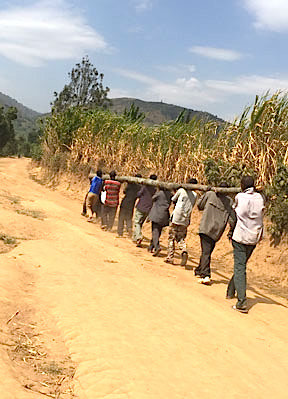 In the capital, Kigali, you will find many people speaking fluently, but in the rural parts of Rwanda, this is not so. Students have been reading English on blackboards, but teachers often deliver content in Kinyarwanda for comprehension and there has been little opportunity to speak. Our job is to encourage and improve English speaking at our school for both students and staff, and while it is a mighty task, we are experiencing success. We teach oral English to all 350 students and hold workshops for our staff every week. Those classes are key to the development of English speaking, but it is our extra-curricular work that is garnering the most success. We play games with the students, climb mountains together, share a meal, join in a cooking experiment, aid in animal care or just sit and chat. The students and staff own language knowledge and these opportunities have unlocked the years of rote and allowed for expression. It is very gratifying. 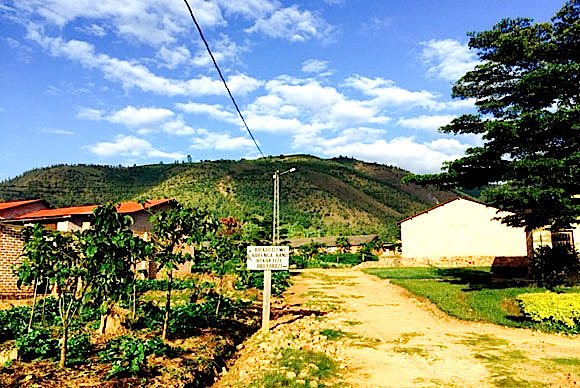 We live in the eastern province of Rwanda in the smallest and most rural of villages, and our journey to our new home took my breath away. We had completed our 10 days of training in the capital city and I had grown accustomed to the paved road, the sidewalks and such ... The sophistication of the city quickly gave way to rural Africa, where the women carry the world upon their heads as goats and sheep compete for the road and poverty unfolds in jolting and searing magnitude. The ragged mountain road dipped and turned and as we balanced on the edge of oblivion, fear found its way into my adventurous heart. We arrived safely at our new home and were received with warmth and curiosity. No westerner had lived in our village since 1993, when the Belgian nun who founded the school evacuated in the face of genocide. We are the first Peace Corps Volunteers. Our village center is perhaps 200 meters of small cement shops where one can buy flour, oil, rice, sugar, and such staples. I have become adept at asking where to find the items I need with my rudimentary Kinyarwanda, and transactions are much easier these days. My favorite shopkeepers are so kind and patient with me, and,are always pleased to show me if there is peanut flour or whole wheat. On Fridays, we have market day and you can buy tomatoes, potatoes, onions, garlic, bananas, avocados, cabbages, carrots and such. 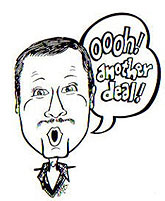 It is necessary to bargain in Rwanda, and my friends have admonished me for my practice of bargaining up. They say I cannot do that. But you know the face of poverty is difficult to bear and so I am so happy when my request to "kabanya" ( lower the price) is refused. So Kirk and I journey in this stunning country. We hike and run up the mountain paths and greet all the children on our way. The little ones race into Kirk's arms as he will swing them into the air and hug them as they beam to have such love. We greet the elders with deep respect and never fail to extend a hand -- as not to touch is not to greet. The elders congratulate us for "sporting" as they labor up and down the mountain with massive loads ... We've made friends along our routes and our hearts ache for the devastating poverty that challenges the people on a daily basis. Everyone is working so hard and every inch of the mountain land is cultivated by hand. There are no machines, no tractors, no wagons, no horses. The people do every task and are cutting fields with machetes, hoeing, digging, planting and harvesting. Jerry cans are filled from a pipe in the valley and people carry the heavy containers back up the mountains to their homes with babies secured upon their backs and sacks of produce on their heads. They cook their meals on the charcoal they have harvested from the eucalyptus trees. They cut the trees with machete, slow burn the wood for several days and bag the charcoal chips for cooking. Despite the daily intensive labor, there is not enough. Perhaps you have grown and harvested food for your family but need to buy shoes or a school uniform or medicine. You must sell your food and buy such items. And then, the children are hungry. Over a third of the children are stunted in their growth, and their tiny bodies ache for nutrition. Malaria is rampant and the health clinic is overrun with illness. There is no doctor in our village. Kirk and I are returning from our school break in Bwindi Impenetrable Forest in neighboring Uganda. 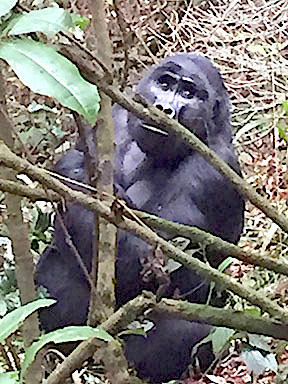 We have fulfilled Kirk's lifetime dream of seeing the majestic Mountain Gorillas and trekked up the mountains and through the rain forest to find a group with three silverbacks, mamas, youth, and two babes. We followed them for hours in total wonder and awe. Our daughter Sophie and her love, Anton, will begin their Peace Corps service in Uganda this November. You can imagine our joy in meeting the people of their future home and laying eyes on the land they will walk upon. We will travel back to Uganda when our service ends in December to hold them in our arms before leaving Africa. Now, we head back to our site where the students are arriving for the new semester. We can't wait to be with them again. Lesotho, China, Namibia, and Rwanda. Peace Corps has opened the world to us and afforded us a deep and abiding love and respect for the people of the world. There are no boundaries to the human heart, and we all speak the language of humanity. 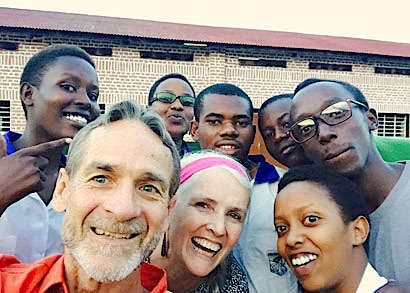 Top: Marie and Kirk with members of the English Club that they lead. Second: Kirk with some of the students. Third: Students separate corn from the cob for chicken feed. 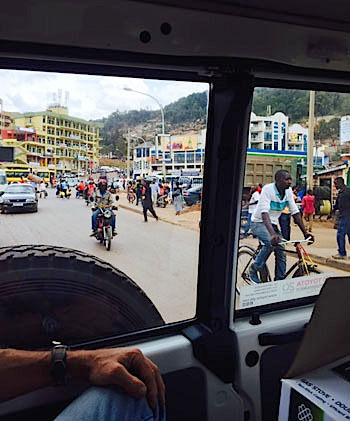 Fourth: Leaving on the ride from the bustling city of Kigali for "our very rural site." The trip of 50 miles takes four to five hours. Fifth: A mountain gorilla seen on a trek through the rainforest. Sixth: Marie gets her first lesson in separating the corn from the cob for chicken feed. Left: Carrying a log to be used for bridge repair. 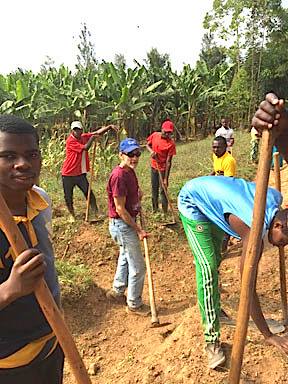 Right: Umuganda, the last Saturday of the month, when "all of Rwanda participates in community improvement." A view of what Marie describes simply as "our campus."